The team demonstrated that a complex of proteins called PRC2 (Polycomb Repressive Complex 2) was essential for the development of mammary (breast) tissue from stem cells. They also identified that certain breast cancers may develop as a result of the loss of PRC2. The research, which integrated cutting-edge tissue culture systems and bioinformatics techniques, was led by Dr Ewa Michalak, Professor Jane Visvader, Professor Gordon Smyth and Professor Geoff Lindeman. It was published in the journal PLOS Biology. The development of breast tissue from stem cells is a highly regulated process impacted by many genes, which may be switched on or off at different stages and in different cells. Our researchers demonstrated breast development relies on a genetic ‘brake’ called PRC2, a protein complex which silences many genes. Errors in this process may be linked to the development of poor prognosis breast cancer. The research relied on a tissue culture system called mammary organoids, which enabled the researchers to pinpoint how PRC2 enables normal breast tissue development. Our genome contains many genes that are required for specific processes in different parts of our body, or are only required at distinct times during development. Systems that correctly switch certain genes on or off in particular cells are critical for the normal functioning of our body, and disruptions in this process have been implicated in driving many types of cancer. The team discovered that without an intact PRC2 complex, mammary tissue could not develop, Dr Michalak said. “We were able to attribute this to the loss of mammary progenitor cells, which are precursor cells involved in tissue development. Through our collaboration with bioinformatics experts we could pinpoint the genes that became activated by the loss of PRC2, and how this stifled mammary development,” she said. The research may have implications for understanding how breast cancer develops, said Professor Lindeman, who is also a medical oncologist at the Peter MacCallum Cancer Centre. The team’s discoveries relied on genetic models that contained no PRC2 complex, but this presented substantial technical hurdles. “Without PRC2, mammary glands cannot develop – meaning there are no cells to study using conventional models,” Dr Michalak said. “We took advantage of a recently developed tissue culture system, mammary organoids, which are grown from single mammary stem cells into 3D structures that can be grown in the laboratory but recapitulate the normal development of breast tissue. 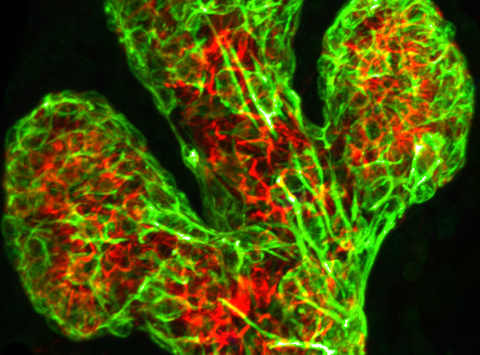 Professor Visvader said this was the first time mammary organoids had been used to overcome the challenge of studying genes that are essential for complex processes. “There are many genes that exert complex and critical influences on developmental processes, and these have traditionally been very difficult to study. The research was supported by the Australian National Health and Medical Research Council, the Australian Cancer Research Foundation, the National Breast Cancer Foundation and the Victorian Government.